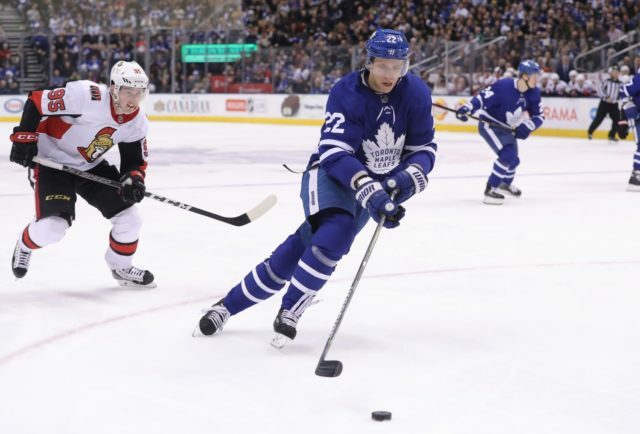 Would it be enough for the Maple Leafs to offer up …..
Steve Simmons of the Toronto Sun: Since the Buffalo Sabres could use help on the blueline, would they be interested in Toronto Maple Leafs defenseman Nikita Zaitsev with the Maple Leafs covering a portion of his contract. Since the Maple Leafs don’t have a first-round pick this year, would a second- and a third-round draft pick, or a draft pick and Connor Brown be enough to land Philadelphia Flyers Wayne Simmonds? Emily Sadler of Sportsnet: The Ottawa Senators are letting teams know that if their pending free agents – Matt Duchene, Mark Stone and Ryan Dzingel – will become available on the trade market, it will be 10 days before the deadline according to Elliotte Friedman. Johnston adds that if the Senators were to trade Duchene at the deadline, Duchene may not rule out re-signing with the Senators on July 1st. Nick Kypreos says there may be an eight-year offer for $64 million from the Senators. If Duchene goes to free agency, he can only get seven years, if he wants that same money ($64 million) that would be over $9 million and that may not happen from anyone.